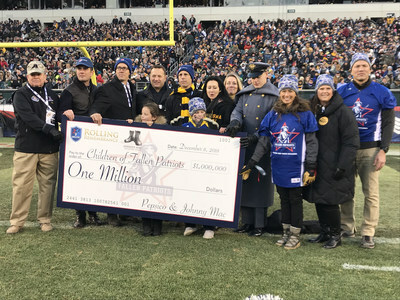 DULLES, Va., Dec. 13, 2018 /PRNewswire/ -- PepsiCo and Johnny Mac Soldiers Fund presented Children of Fallen Patriots Foundation (Fallen Patriots) with a $1,000,000 check during one of America's biggest collegiate rivalries, the Army vs. Navy football game. Based on the $32,000 funding gap between government assistance programs and the cost of a four-year degree, this generous contribution will help provide Fallen Patriots scholars over 160 years of debt-free college education. The ongoing support from PepsiCo and Johnny Mac Soldiers Fund directly helps fulfill Fallen Patriots' mission to provide college scholarships and educational counseling to military children who have lost a parent in the line of duty. Kami Kennedy and her two children, Maggie and Brody, are among the surviving military families Fallen Patriots aims to serve and were in attendance during the check presentation at halftime. Major Thomas Kennedy lost his life in 2012 while serving overseas in Afghanistan. Tom is a graduate of the United States Military Academy at West Point and loved rooting for his team. Both kids take after their Dad through a shared love of sports. Kami says, "To stand on the field during halftime of Tom's favorite game of the year is something we will never forget. It was both energizing and emotional to feel the support of the crowd." Kami says she is comforted by Fallen Patriots, knowing the college education of each child will be taken care of. "We believe one of the best ways to honor our fallen heroes is to invest in the future of those they loved most – their children," said David Kim, co-founder and CEO of Fallen Patriots. "A college education is the key to a bright future for any child and the generosity of our supporters is making those hopes and dreams come true." Earlier this year, PepsiCo's 4th annual "Rolling Remembrance" fundraising campaign – a 7,000-mile relay that transports an American flag, originally flown on a UH-60M Blackhawk Helicopter in Afghanistan during Operation Enduring Freedom 2012, from coast to coast in the United States – raised more than $250,000 to support Fallen Patriots, which was then matched by the PepsiCo Foundation. Contributions from partners including 7-Eleven, the Army & Airforce Exchange Service, Foodland and Stater Bros. were made in the form of cash donations, in-kind donations and in-store customer promotions. "PepsiCo is proud to recognize the sacrifices of veterans and their families by helping ensure a bright future for the children left behind," said Jim Farrell, PepsiCo Vice President of Logistics, Distribution and Transportation. Farrell served five years in the U.S. Army which inspired his involvement as a member of the Fallen Patriots board. Since 2014, Johnny Mac Soldiers Fund has contributed over $6,000,000 to Fallen Patriots' mission. "We are pleased to partner with Fallen Patriots to honor military service and sacrifice by providing college scholarships to children of our nation's fallen," said MaryEllen Picciuto, Johnny Mac Soldiers Fund President. She is also a West Point graduate and Army veteran. Children of Fallen Patriots Foundation honors the sacrifices of our fallen military heroes by ensuring the success of their children through college education. Since 2002, Fallen Patriots has provided approximately $26 million in total assistance, including college scholarships and educational counseling to over 1,250 military children who have lost a parent in the line of duty. Nearly 20,000 children from across America will need future assistance. PepsiCo products are enjoyed by consumers more than one billion times a day in more than 200 countries and territories around the world. At the heart of PepsiCo is Performance with Purpose – our fundamental belief that the success of our company is inextricably linked to the sustainability of the world around us. We believe that continuously improving the products we sell, operating responsibly to protect our planet and empowering people around the world is what enables PepsiCo to run a successful global company that creates long-term value for society and our shareholders. For more information, visit www.pepsico.com.